The most controversial part of the Republican response to the State of the Union on Tuesday night, delivered by Gov. Nikki Haley of South Carolina, was cut out of the version delivered in Spanish by Rep. Mario Diaz-Balart of Florida. It wasn’t dropped because it was controversial. It was dropped because it wouldn’t have been. Haley’s speech was, in large part, an insistence that the Republican Party could and should be a party that values integration and unity and rejects divisive populist rhetoric. It was widely understood that this was an implicit rebuke of her party’s current frontrunner for the presidential nomination, Donald Trump, and Haley is already being criticized by Trump sympathizers within the conservative movement for the swipe. Because Haley’s speech was so conciliatory, Diaz-Balart didn’t need to overhaul it to appeal to Latinos who might be more skeptical of Republicans than the average viewer in English. But Diaz-Balart went beyond rebuking Trump. He simply pretended he didn’t exist — and heavily implied that a Republican president would pass immigration reform. They are grave reminders of why we need to keep protecting freedom of religion, the freedom to practice one’s faith without fear of violence, the free expression of ideas, and freedom to live without fear of terrorism. The American people have demonstrated that they will always, always defend these freedoms. This is certainly a slightly more optimistic view of America than Haley offered — the willingness of Americans to respect all religions is taken for granted, rather than needing to be defended. But that’s because the frame of reference is different. Haley was implicitly contrasting South Carolina with Ferguson and Baltimore, where protests over mistreatment of African Americans have (briefly) spilled over into unrest, as well as with places where Islamophobia has led to vandalism and violence. Regrettably, there are countries where basic liberties are not respected, and where governments don’t represent their people. The mullahs in Iran, dedicated to radical Islamism and nuclear ambitions, prohibit dissidence and jail independent journalists as spies. In North Korea, the people are isolated from the rest of the world, without access to internet or communications. And here in our own hemisphere, the people of Cuba have not had a free election in more than 55 years, and political detentions and oppression continue to grow. And the people of Venezuela suffer from political oppression and corruption of their most important democratic institutions. The comparison between living freely in the US and living less freely elsewhere appeals directly to many of the Latino voters Diaz-Balart is trying to reach: It’s their story, or their parents’, or (less likely for a Spanish-language address) their grandparents’. But it’s also a foreign policy choice. Diaz-Balart comes from, and represents in Congress, Miami’s anti-Castro Cuban-American Republican community — the last reliably Republican Latino voters, and a community that could help the Republican Party win Florida in November. Neoconservative foreign policy views have been discredited in much of the GOP, or at least are treated with a great deal of skepticism — Haley made several allusions to ISIS and attacked President Obama’s deal with Iran, but didn’t say anything about, say, Syria. But standing up to hostile regimes in the name of human rights is still an important principle to anti-Castro Cubans. At the same time, it’s obvious that our immigration system needs to be reformed. The current system puts our national security in danger and is an obstacle to our economy. It’s essential that we find a legislative solution that protects our nation, defends our borders, offers a permanent and humane solution to those who live in the shadows, respects the rule of law, modernizes our visa system, and boosts the economy. I have no doubt that if we work together we can make this happen, and continue to be loyal to the noblest legacies of the United States. A legislative solution that includes border security, reforms to legal immigrant visas, and a “permanent and humane solution” for unauthorized immigrants? That sounds a lot like comprehensive immigration reform, which Diaz-Balart is one of the few remaining congressional Republicans interested in working on. As a matter of policy, nothing Diaz-Balart said contradicts anything Haley said, or vice versa. Supporters of comprehensive immigration reform have long argued that it’s the best bet for “stopping illegal immigration,” because it would make it easier for people to come legally while increasing border security. And for that matter, Diaz-Balart’s “permanent and humane solution” is vague enough that it could hypothetically apply to the plans of some GOP presidential candidates (though at this point, none of them appears interested in passing a single broad immigration bill). But what’s interesting about the difference between the two passages is that Haley is just as interested in distinguishing between “good” and “bad” legal immigrants as she is between legal and unauthorized ones. That’s an implicit reference not to Latino immigrants, but to Syrians and Iraqis. Diaz-Balart could have kept those lines in. He (and whoever adapted the speech) didn’t. Diaz-Balart’s passage about immigration could have been taken from a speech from five years ago (who knows, maybe it was). That doesn’t mean it’s dated; it means that the audience he’s speaking to knows exactly what immigration reform is expected to look like, and expects to hear it from politicians. In English, Republicans have been tailoring their immigration rhetoric to concerns of the moment for the past few years — from the border crisis of 2014 to concerns about refugees today. In Spanish, the problem and solution are pretty well set. The problem is getting there. We need to accept that we are part of the reason that important bills for our nation weren’t turned into law. We have to fix that reality. The new Congress has already started with this, and with a Republican president in the Oval Office there would be someone who would sign the legislation you have asked for, not veto it. Yes, it’s possible that Diaz-Balart and company weren’t trying to refer to immigration reform as one of the “important bills” that weren’t turned into law. But it is not terribly likely. After all, a paragraph earlier, while Diaz-Balart condensed much of Haley’s discussion of “frustrations” felt by the American people, he definitely kept in the line, “A frustration with promises made and never kept.” To a Latino audience, immigration reform is President Obama’s most famous unkept promise. Obviously, Diaz-Balart wasn’t just referring to immigration reform. The GOP Congress that took office a year ago hasn’t shown any interest in passing it, and Speaker Paul Ryan has outright promised that he won’t bring any broad immigration bill to the floor while Obama’s in office. But Republican supporters for immigration reform have always argued that it will be easier to pass under a Republican president than a Democratic one, because the Republican president can provide cover for members of his party. Conversely, Diaz-Balart and others believe that Democrats don’t really want immigration reform to pass, because they want to keep it as an election issue. When Diaz-Balart promises that a Republican president would “sign the legislation you have asked for, not veto it,” he’s probably referring broadly to Republican priorities that would get passed under unified government. But in the context of promises made and not kept, and bills left unpassed, the message is definitely there for those who care to see it: A unified Republican government will pass immigration reform. 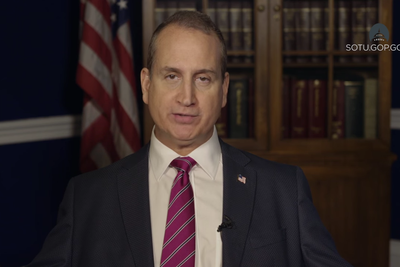 Diaz-Balart made no promises on Tuesday night. He would have been foolish to — his entire point is that Latinos should stop trusting Democrats to keep their promises. And in the context of the 2016 presidential election, it’s really hard to believe that Diaz-Balart and GOP immigration reformers have the pull to pass reform. But if Haley’s English-language response was a glimpse of what the Republican Party might look like if it cared a little bit less about pacifying Trump and his supporters — or, for that matter, what it will look like in the general election — Diaz-Balart’s Spanish one was an illustration of how much stronger and more credible the party’s Latino outreach would be with such a message to build on.